A couple of years back, on a cold January night, Postlibyan and I ventured out to the Star Bar to see the Fairburn Royals, a heretofore unknown band for us. If I remember correctly, I liked them a lot, and thought that their sound was a very enjoyable blend of Athens-style jangle and semi-quirky Indie Pop. Later in that year, they released a 4 song EP that could be downloaded from their website. And then The Fairburn Royals seemed to vanish. Now, they have reappeared with a 14 song CD, called The Whistler, released on Atlanta Label Two Sheds. Even though this new record was a long time in the making (which seems to be a characteristic of Athens-based bands), it definitely shows progress as this band has evolved and expanded its musical range. The Whistler begins with Masterpiece, which is a very pretty, guitar driven song. To my mind, it sounds very much like something from The Eskimos, with whom The Fairburn Royals share a member. With the semi-distorted guitars and light drumming in the background, Masterpiece remains quite energetic while vocalist Matt Lisle shows a slight similarity to Built to Spill's Doug Martsch. From there, the band moves on to the poppy, piano-driven Rapture (not a cover of the Blondie song). I remember this song from their live shows, in which I thought the title was Sarabelle. Rapture seems very 60s pop in its structure, with a Leaving on a Jet Plane style melody. Still, this is a nice recording that does this pop song justice, and I like that. The next stand out track on the album is Curse of the Taurean. Swirling in 6/8 time, this has a vaguely psychedelic edge which adds atmosphere to Lisle's take on trying to struggle against the odds. When listening to this song, I understand why press sheets for this album cite that this album is less "alt-country" than their previous releases. While I'm not so sure about that description in an absolute sense, I can say this there is less overall twang and more jangle to The Whistler. Perhaps one other difference to this album is the predominance of slower, more acoustic songs. For instance, Vulnerable focuses on a glockenspiel that meanders in the background of the song. In contrast, An Old Man's Song feels like a slower, more piano-driven version of Secretary's Day, off one of their previous albums. In the case of this song, Lisle's vocals are slow and mournful as he takes on the position of someone frustrated by the youth and exuberance which surrounds him. More importantly, as An Old Man's Song draws towards its conclusion, Lisle demonstrates the strength of his voice, as he sings in his upper range and still maintains the force to deliver his words with conviction. 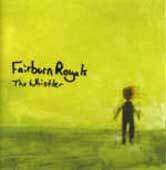 Still, The Fairburn Royals deliver their usual upbeat pop songs on other tunes. For example, the instrumental The Celebrity features a guitar and a keyboard playing alternating, but complimentary, melodies in a straight up jangle pop style. Then, at one point, a second guitar comes in and there are effectively three melodies going on during the same song. Very nicely done, especially when you consider that normally the vocals are a focal point of The Fairburn Royals' music. In contrast, Flying Fool Circus begins with a acoustic guitar over which Lisle sings a somewhat typical pop song. However, this songs takes flight when the electric guitar comes in and acts as a melodic, harder contrast to the acoustic melody. Although the song never comes together in a cathartic manner, the alleged chorus (which is I believe in a different key than the rest of the song) sounds like it could be a lighter version of something by Five-Eight. The final stand out, faster-paced song on this album is the next to last song, K.I.S. , which I also think I remember from previous live shows. I particularly like this song because, like Rapture, K.I.S has a quick paced, driving drum beat which allows the guitar work to build to a climax. And as it reaches this pinnacle, with handclaps and a layer of echo, it reminds me of the better live work of Chicago band Midstates. In the end, it is clear that The Fairburn Royals have used their time off recording and writing to their advantage. Much like Sharks and Minnows' The Cost of Living, The Whistler shows new and different aspects of a band and demonstrates how they matured. With this in mind, The Whistler is a strong, albeit long, showing which clearly reflects the good type of music coming out of the local Athens scene.